This month we have some beautiful pictures but also some bad news. Many island resources are disappearing, and mostly because of too many bad effects from the actions of people. So, please read about loss of habitat on Bimini, see the beautiful Parrotfishes that are among the many reef fishes that may disappear along with our reefs, and see two beautiful Yellow-headed Parrots that are among species of wild birds that are disappearing from the Caribbean. We've recently received some sad news about the loss of wilderness on the island of Bimini and in its surrounding oceans. People are building buildings and docks along the North Sound, the big bay on North Bimini. This construction is cutting down Mangrove forests. Mangrove trees are important along shores as their roots keep waves from eroding the shore. The roots also make habitat for baby fishes who need protected places in shallow water. Without these protected nurseries, the fish of the reef will be seriously threatened. Construction along the shore and dredging channels through shallow water stirs up dirt and sand, making a kind of pollution in what would otherwise be clear shallow water. Baby fish can't survive that kind of pollution. That makes the loss of nursery habitat worse. And construction of docks and waterways is destroying reefs near the shore. Please talk about this loss of habitat in your classrooms. What does this loss of habitat mean to you? What do you think it means for the future of coral reefs in the Caribbean? What about jobs created for people by the construction? Is that more or less important than the wilderness? Is there any alternative, such as a way to make jobs without destroying all the forest and reef? If you are upset by this, please write to the addresses on the University of Miami website about the Destruction of Bimini to express your concern. 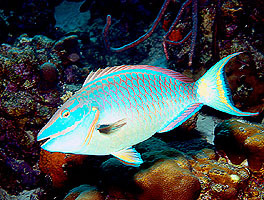 The Stoplight Parrotfish depends on corals for food. One of the most common big and colorful reef fish, the Stoplight Parrot is always fun to see. Click here to get a good look at this Stoplight Parrotfish before the fish of the Caribbean disappear. 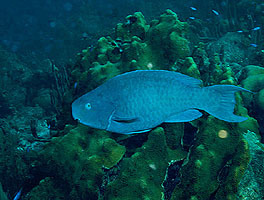 The Blue Parrotfish is much more rare than the Stoplight Parrotfish. ReefNews has been fortunate to see these unusual fish near Bonaire on two different trips. Click here to get a close look at this big, bump-nosed Blue Parrotfish. Parrotfishes get their names because they have beaks like Parrots. 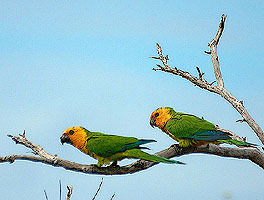 Here are two real Yellow-Shouldered Parrots on Bonaire. Click here to learn about Amazona Barbadensis and why this bird may be disappearing from the Caribbean.